Home video recording studio setup for vlogging. Blogger making videos with LED ring light and smartphone. Teenage girl talking in front of mobile phone camera against pink portable paper backdrop. 4k00:13A young woman or girl looks in the mirror at herself sitting in the car. Bad traffic. hd00:14VLADIVOSTOK, RUSSIA - OCTOBER 5: Interior of airplane, view from a passenger seat. Aeroflot flight from Vladivostok to Moscow. 4k00:20Young girl assembles portable background support system with paper backdrop. Home studio set up for vlog video recording. 4k00:17Teen girl vlogger recording video blog for her lifestyle channel in home vlog studio. 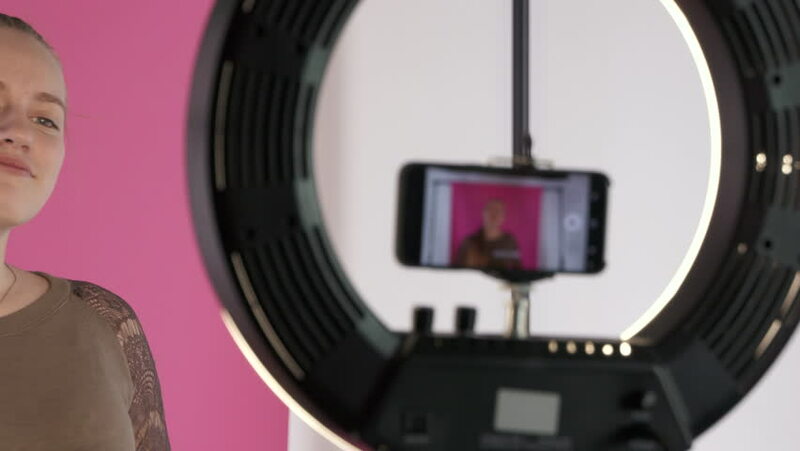 Teenage blogger using smartphone mounted on ring light panel for vlogging. Happy young girl talking to camera. 4k00:17Home video recording studio setup for vlogging. Blogger making videos with LED ring light and smartphone. Teenage girl talking in front of mobile phone camera against pink portable paper backdrop. hd00:15Vlogger with mobile phone camera stabilizer recording outdoor video blog. hd00:12Shopping in photography and camera shop. Store manager gives professional advice to customer. Teenage girl buying flexible portable tripod. Video equipment and gear for travel vlogging. 4k00:26Teen girl recording vlog for her lifestyle channel having fun in front of camera. Using digital camera with external mic mounted on led ring light to record a video blog at home. 4k00:16Teen girl vlogger recording vlog for her lifestyle channel in camera store. Girl talking about photo video travel vlogging equipment and gear. 4k00:15Teen girl vlogger recording vlog for her lifestyle channel in camera store. Girl talking about photo video travel vlogging equipment and gear.